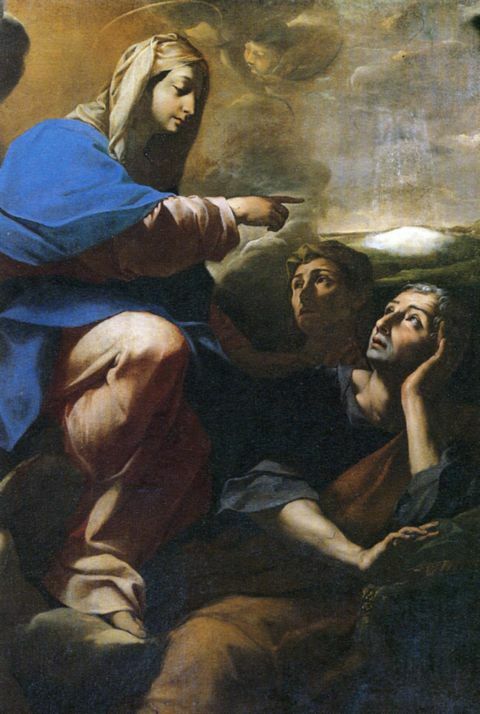 In August of that year, John had a dream that the Virgin Mary wanted a church built in her honor in Rome. He was told that they would know where to build it because snow would fall on that spot. Amazingly, Pope Liberius had the same dream on the same night. Despite it being a very hot summer in Rome, snow fell the next day on Mount Esquiline, one of the famous Seven Hills. However, it fell into a precise rectangular pattern – as if outlining the boundaries of the church Mary desired to have built. 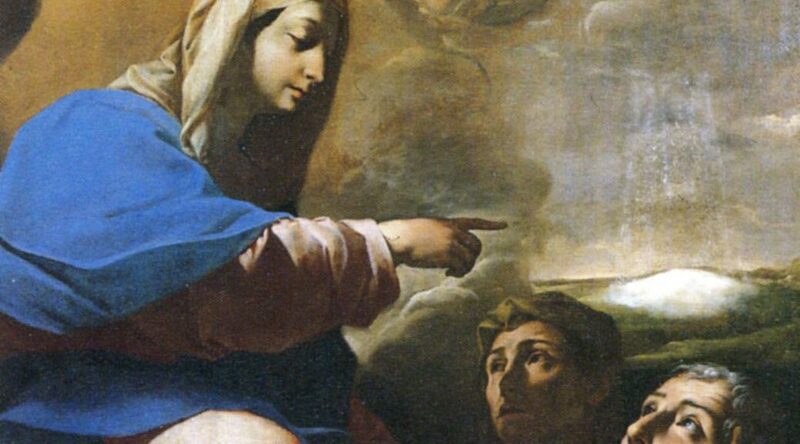 When Pope Liberius showed up on Mount Esquiline to witness the miraculous snowfall, he found John and his wife already there, kneeling in prayer to the Virgin. People crowded to see the rectangular patch of snow, which would not melt despite the hot summer heat of August. John was convinced that its shape and size indicated that a church should be built on that precise spot. As soon as the plot for the building had been staked out, the snow melted. John met the costs of building this church, which was completed in 354 A.D. 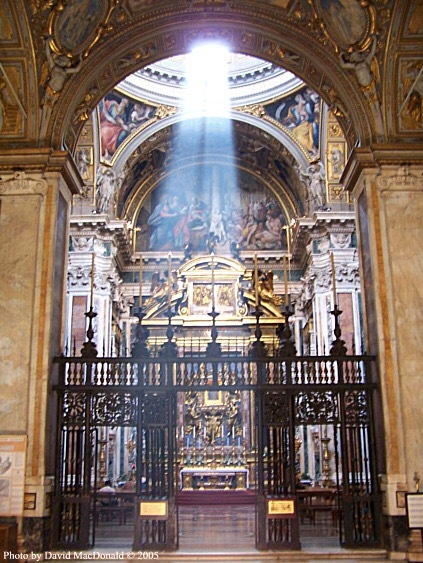 It was dedicated as the Basilica Liberiana after Pope Liberius. Seventy years later, it was rebuilt on a grander scale by Pope Sixtus III, who added decorations and ornaments of silver. It was renamed the Basilica Sixti at that time. 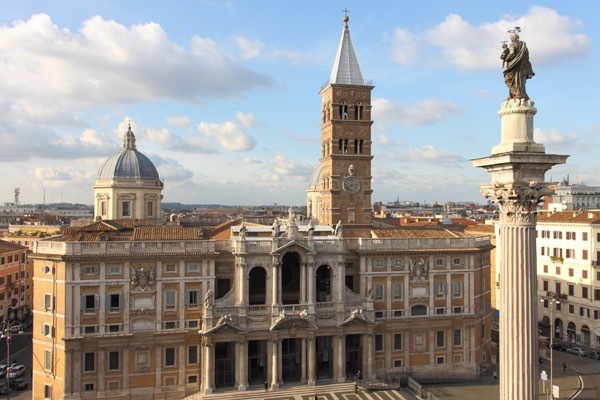 Today, it is called the Church of Santa Maria Maggiore (St. Mary Major) and is one of the largest basilicas in the world. They celebrate the Miracle of the Snow every year on August 5th. Pope Liberius provided a special painting of Madonna and Child from St. Helen, mother of Emperor Constantine, to be housed in this new basilica. Many miracles are attributed to this wonderful painting. When Gregory I was Pope (590-604 A.D.), Rome was ravaged by a plague. Pope Gregory carried the image of the Holy Mother in a procession from the basilica as far as Hadrian’s Mausoleum. When the procession arrived, they heard an invisible heavenly choir singing Regina Coeli. When the Pope asked the Virgin to pray for the city, he saw an apparition of St. Michael replacing the sword of vengeance into its scabbard. And the plague ended. The magnificent Basilica of St. Mary Major, still stands today as the seat of devotion to Our Lady of the Snows. Father Paul Schulte, of the Missionary Oblates of Mary Immaculate, introduced a shrine in her honor in the Midwest in 1941, which stands today in Belleville, Illinois.